Bank of Montgomery is a Presidential Host of the community reception honoring Dr. Chris Maggio, his wife Jennifer and the first family upon Maggio’s investiture as 19th president of Northwestern State University. The reception will take place at the Arnold R. Kilpatrick President’s Residence, 1 Normal Drive, immediately following the formal investiture ceremony, which will begin at 11 a.m. Friday, Sept. 15 in A. A. Fredericks Auditorium. The reception is a time for wellwishers to meet and greet the Maggio family with refreshments and the featured talents of students in NSU’s School of Creative and Performing Arts. All friends of NSU are invited to attend. 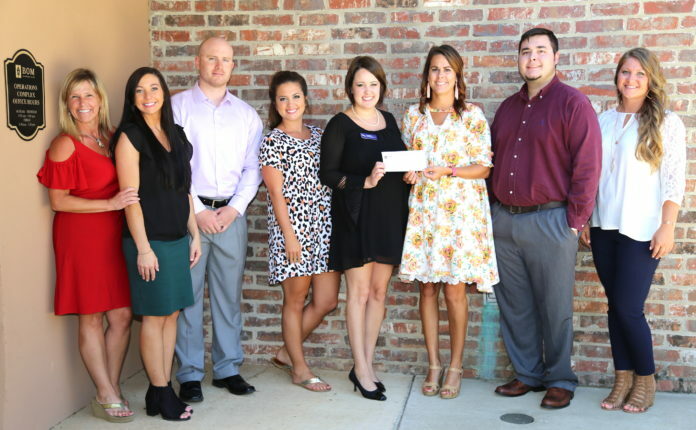 From left are NSU Development Officer Jill Bankston, BOM representatives Micah Foshee and Luke Raspberry, NSU Development Officers Rebekah Burleson and Brittney McNeely, and BOM representatives Carrie Beth Hough, John Sullivan and Tara McKinney. Opportunities to host the reception are still available. For information, contact Bankston at (318) 357-4414 or visit nsula.edu/investiture and scroll to the link with information on the reception.